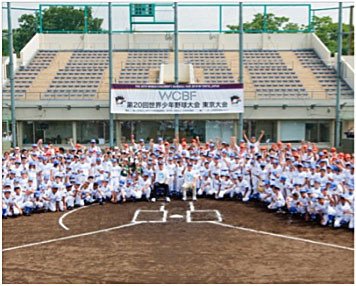 The 2012 edition of the World Children's Baseball Fair (WCBF) will be held in Mie, Nara and Wakayama Japan from July 22 to 30. Over 300 children from 15 countries and regions will be attending the event to learn the proper mechanics of baseball fundamentals. The one week cross-cultural program specifically targets the youth while providing a valuable experience for the participants to foster international friendship through the sport of baseball. The International Baseball Federation (IBAF) has been a partner of the WCBF since the inaugural event in 1990 and seven certified coaches will represent the organization at this year's event as "Global Baseball Ambassadors". The event also looks to serve as a platform to interact with and encourage the local communities of Mie, Nara and Wakayama, severely damaged areas after hit by the Tropical Storm Talas last August.